Inspiration comes from all places, but mostly from existing games. The challenge is to take a concept from a favorite game and adapt it, modify it, and change it enough to have something new and fresh but also familiar. I’m currently trying to focus on two game ideas and jotting down the flood of other ideas into a notebook for future use. Here’s hoping that I never lose that notebook and that I can decipher my excited scrawl when I’m ready to evaluate them! Zookeeper is my first game and the furthest along in development. In Zookeeper, players are interns at the zoo with aspirations of becoming a full time employee. The catch, of course, is that there’s only one job available. The player who looks after and feeds the most animals wins. It’s a simple premise found in tons of games. Zookeeper was originally themed as fireman trying to put out a house fire without getting in the way of each other, but more on that in a later post. 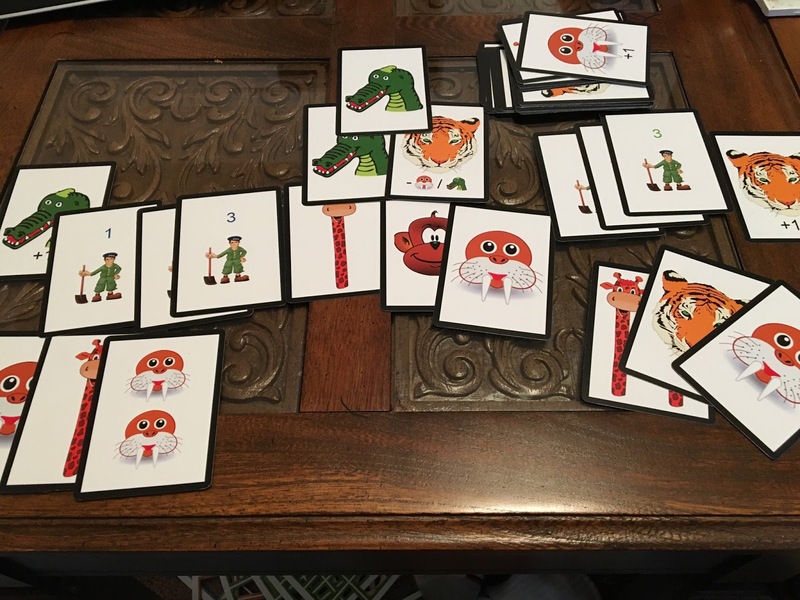 The game utilizes some bluffing and second guessing mechanics in how the players feed and take care of animals and is progressing nicely through prototype stages. I am extremely excited for testing opportunities at some upcoming Meetups. Press your luck is a neat mechanic. It’s easy to grasp and the tension is there immediately. Do I keep rolling the dice in hopes of big points or play it safe and bank what I have? Do I draw 1 more card and lose it all, or do I pass the turn and hope for the best? It also lends itself seamlessly to many different themes. Explore a new planet while risking an alien attack? Venture deeper into the jungle in search of riches, hoping you can remember the way back home? Risk a deep dive into the ocean looking for elusive fish to photograph before you run too low on air? It’s a classic risk vs reward mentality that people instantly understand. Not surpisingly, my other idea is a press your luck game. It draws inspiration from both Incan Gold and Dead Man’s Draw. Incan Gold is hands down my favorite press your luck game, and it has been a little challenging trying to channel some of its ideas without just outright retheming the game with minor changes. Each turn gives the players a simple choice- risking another trip into the trap-filled temple in search of jewels or safely returning to the campsite with all your points intact. The simultaneous play really adds a fantastic layer too, as you’re never quite sure if someone else is going to escape with you, forcing a split of the leftover treasure. It’s a really tight, fun, and quick design that leads to some memorable in game moments for all players. Dead Man’s Draw, on the other hand, is extremely swingy and frustrating, but having a special power on each card and variable player powers is really cool. I’ve lost way too many games playing the app on the last turn up 40 points. There’s too much “take that!” with some of the card powers for me, but I really like how easy the game is to play. The app is a fun time sink for me. Being able to count cards is a big advantage in this game, but I can’t count cards to save my life! I want to shy away from how confrontational this game is while continuing to explore unique card abilities and variable player powers. Combining what I find fun from both of these games and creating something new has been challenging. Fun, but challenging. My idea is currently themed as a pizza shop with players fulfilling orders. It combines Dead Man’s 1 at a time game play and variable player powers with Incan Gold’s busting mechanic and more passive approach. There are also more reasons to stop and claim points even if the danger of busting is slim. Every card flip should lead to an interesting decision for the pizza maker!